NOTE - This vehicle is currently stored away from the Museum and is not on public display. This bus has a 7.7 litre AEC engine (the smaller option available from AEC at the time) and a sliding mesh gearbox. 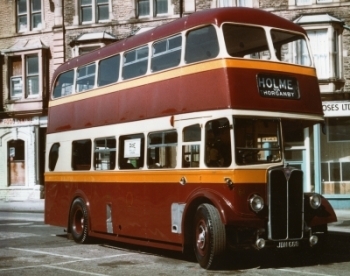 The traditional Yorkshire choice of bodywork from Charles H Roe of Leeds included platform doors to suit the longer distance nature of the routes this bus would work. York Pullman was established in 1926 when garage owner Norman Pearce started a service between York and Stamford Bridge, and the company grew to operate coaches and buses, including a need for double deck buses. The company changed ownership a number of times over the decades, the name seemingly disappearing in 2000, when the remaining local bus services were sold to First. However, the company name has recently been revived, along with the company's traditional colours. No. 64 continued in service until 1971, after covering 840,000 miles in service, and twice having to be rebuilt after collisions with low bridges in the York area. After a short spell in the care of Terry Robinson, No. 64 passed to Tony Peart. Tony Peart was a very well known and widely respected figure in the preservation movement. The standard of restoration plus ongoing care lavished upon these buses (see also Doncaster 122) over the years has set a gold standard for other preservationists to try and emulate. Tony was a long-standing member and enthusiastic supporter of the LVVS and the Society was honoured to have these two fine vehicles bequeathed to us upon his death in 2006. January 2010 - New battery connections are being fitted. July 2010 - A set of new batteries has been fitted. January 2011 - The clutch stop mechanism has been cleaned and adjusted. The windscreen rubbers have been replaced. April 2011 - New wiring for the lower deck bells has been fitted.